The Diamine 150th Anniversary inks come in these triangular, slice o' pie-shaped glass bottles. Collecting eight of the bottles and putting them together would make a circle. And what do you know, there are sixteen bottles (which I believe were released in two sets of eight). I don't own a bottle of a 150th Anniversary ink, but I have interacted with them. They're quite flat, like J. Herbin bottles, so they'll be difficult to fill past the halfway mark. However, they should be pretty easy to tip. 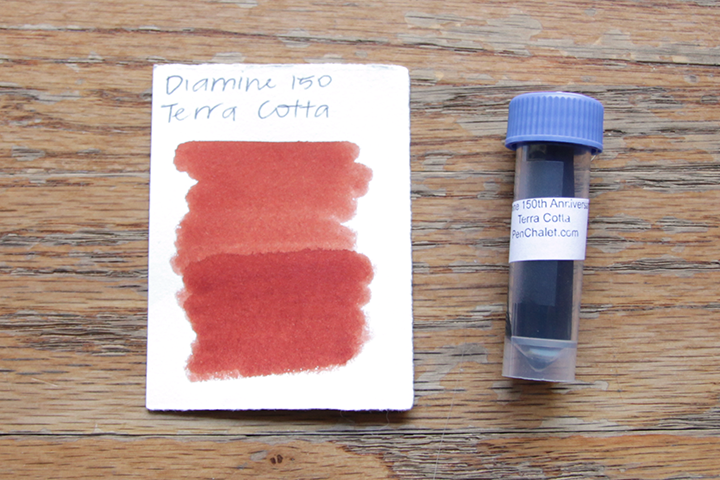 Diamine Terracotta is an orange-brown. Terracotta has quite a bit of water resistance, leaving behind a relatively readable amount of orange dye. The ink was just barely dry at the 60 second mark, which is quite good for an orange-brown ink! On Tomoe River paper, it took over 60 seconds to dry. This is an interesting color. In thinner, drier nibs, it leans more orange. In wet nibs, it goes down an orange-toned brown and stays that way. There is a slight amount of silver sheen, but only where the ink has really pooled. There's no shading at all. On Midori MD paper, it seems like the cream tone brings out more of the orange in the ink. In my pictures, the ink looks quite dark. In reality, it's a bit lighter and more orange. However, on Tomoe River paper, it's still a little more brown. I compare it to some other orange-browns I have. Most of them are fairly close, though not quite. 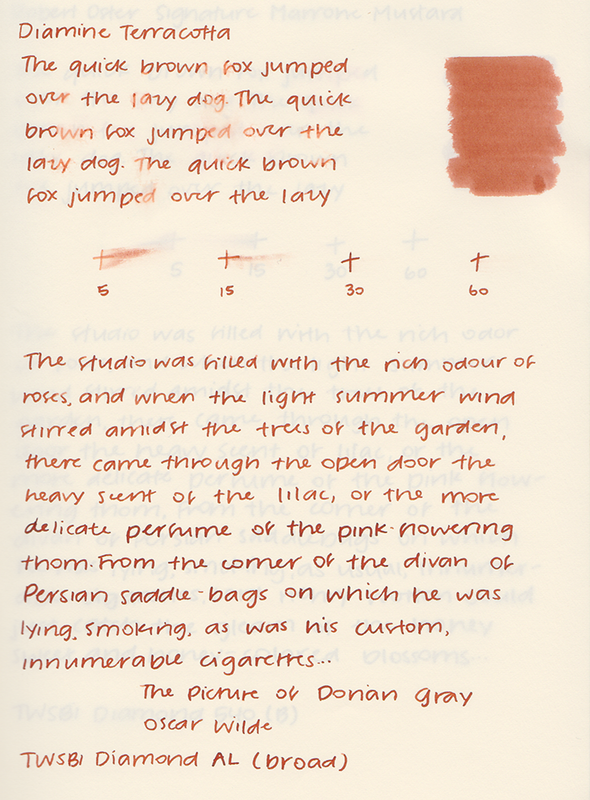 Diamine Ancient Copper and Noodler's Antietam are both redder and darker. Kobe Arima Amber is a bit more orange than the redder Terracotta. Colorverse Wisdom of the Trees Ginkgo Tree is more orange as well. 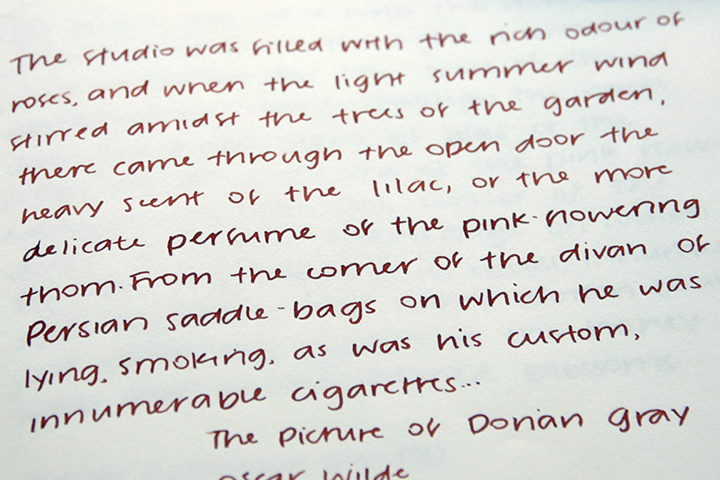 I have this ink in my TWSBI Diamond AL with a broad nib, which writes more like a medium than my other TWSBI broads. They play well together. I haven't had any issues with crusting or hard starts. 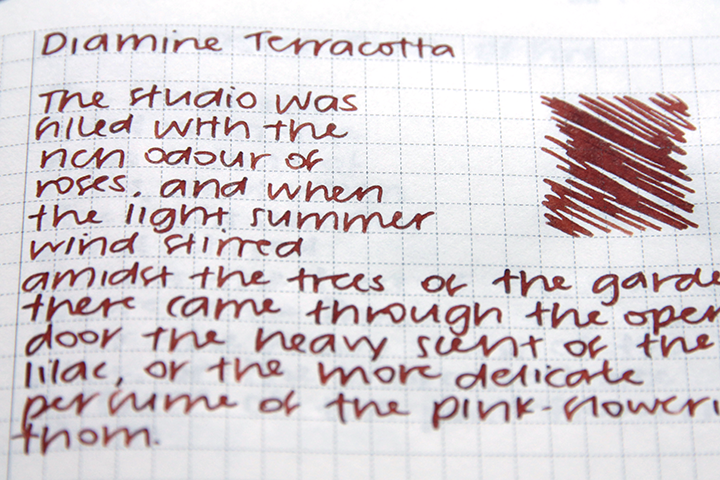 Diamine Terracotta is a great, well-behaved color, though maybe I'm biased? You know I love my orange-browns. You've heard my little spiel that I physically cannot purchase more bottles of ink right now, but boy, do I want to. I have Burnt Sienna from their standard range, which is a gorgeous orange earth color but quite low saturation (and much more affordable). Terracotta looks so similar that I can't imagine what gives it the extra value? p.s. I have a good tip as to accessing affordable Diamine Inks, but I don't want to crash the market, so p.m. me if you're interested! 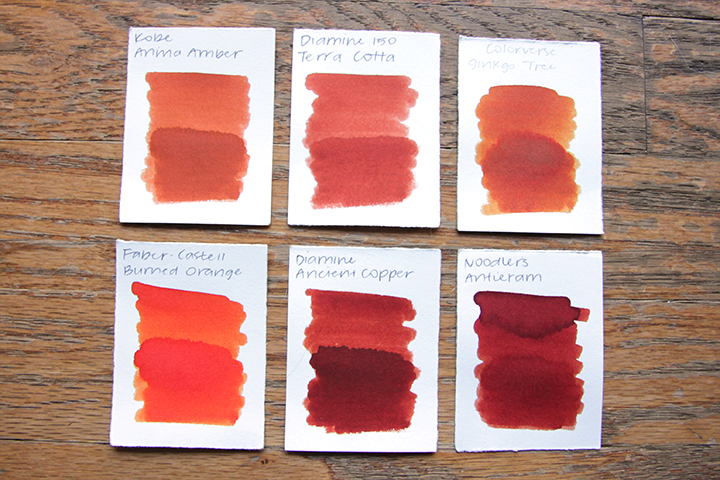 It looks like Terracotta has a bit more red to it, while Burnt Sienna is more neutral. They're certainly quite similar! I would imagine the premium is simply because Terracotta is part of their anniversary range. Thanks for the offer! I'm not currently collecting bottles since I'm just about drowning in ink right now, but I appreciate it!